A lot of people wanted to know how to downgrade I5801 from 2.2 to 2.1. You need to flash the 2.1 firmware on top of any firmware. Here I'm going to show how to flash the 2.1 firmware (DDJG6-INDIA) on your Galaxy3. The next important point is to download the I5801DDJG6_Complete_Package. 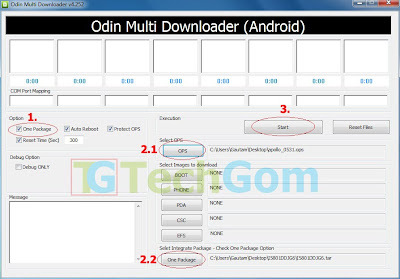 Once you have all the things mentioned above you can now install DDJG6 on your Samsung Galaxy 3 in a few minutes. Extract I5801DDJG6_Complete_Package.rar file with the password "techgom.blogspot.com". On extraction, you will find a folder named "I5801DDJG6_Complete_Package" inside that folder there will be 1 folder("I5801DDJG6") and 2 files("apollo_0531.ops", "I5800_Odin_Multi_Downloader_v4.252.exe"). Inside the I5801DDJG6 folder there will be a single file by the name of "I5801DDJG6.tar", this is file we are interested in and is the actual firmware which we will be using later during flashing. Enter Download Mode by pressing power button + menu button + vol down button simultaneously. Open ODIN and then plug in the USB cable. 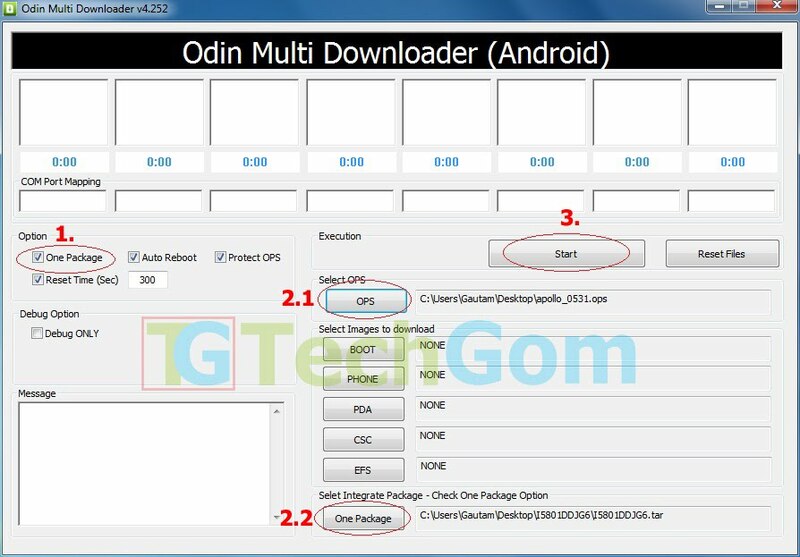 In ODIN Multi Downloader, there is an option "One Package" you need to have that ticked. Select the "apollo_0531.ops" file in OPS. Select the "I5801DDJG6.tar" file by clicking One Package button at the bottom. Click on Start wait till you see pass in ODIN before you unplug your phone. Congratulations!! You have successfully installed 2.1 DDJG6 firmware on your Samsung Galaxy 3.You can now upgrade your phone via Kies once the update is available. Glad that you found it useful!! Let me know if you have any issues while downgrading.. Flashing this firmware will make your phone run 2.1 with Indian CSC! You can directly install 2.2 DDJP2 via ODIN from here. my phone got stuck when updating to 2.2 foryo indian rom...phone doesnot start n it shows copyin error on bootig screen ...what i have to do??? You can turn off the phone and enter download mode and start again! hi..i found your blog really useful. My phone hangs pretty often n when someone calls me it automatically gets disconnected within few seconds...and it shows signal out sign.on the contrary when I call some 1 there is no disconnection..I am not sure whether others also facing similar problem. Can you help me what to do ? Glad to hear that found it useful! Are u encountering this issue after flashing to DDJP2 via ODIN?? Or is this a general question??? I don't think anyone here is experiencing such issues!! instead of showing a "pass" message in the message box, it gives an error as follows: "Cannot open the usb serial port. code: 5"
Could u please help me out with a solution??? Try this on a diff machine! I think that will solve the issue..
Let me know if it worked..
Can you tell me what exactly you are doing??? I'm unable to figure out what you are trying to tell..
Just turn off the phone from download mode! I'm glad u found it useful! I am in UK and purchased I5800.I want to upgrade it to 2.2 can i follow the steps mentioned above.I tried via kies but the update doesn't popup on myscreen. Its showing latest firmware as 2.1. last week I spoke to samsung customer care but they said that 2.2 is released only for galaxy-s. These are instructions for downgrading your phone to 2.1! Yes! 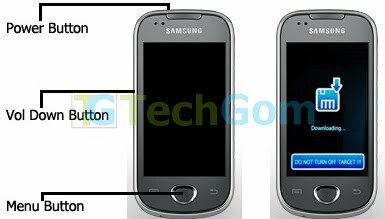 2.2 for Samsung galaxy 3 I5800 is already released for UK! You should be able to update it via Kies! Let me know if you have more questions.. Yes! this is the official Indian firmware. You will get the Froyo 2.2 official update via Samsung Kies if you are on this firmware. Thanks for this post. Was able to downgrade and update to 2.2 via Kies. i am trying to flash 2.1 firmware (DDJG6-INDIA) in galaxy3 i5801. after extracting i5801ddjg6_complete_package I find 1 folder( I5801DDJG6) and two files (apollo_0531.ops) and I5800_Odin_Multi_Downloader_v4.252.exe"). PLZZ can you please provide me 5801DDJG6_Complete_Package. Because here is nothing to display. Please anybody have mail to me at sanket2441987@yahoo.com. hi,i hav upgraded my sg3 officially to froyo 2.2 from 2.1….can i upgrade to cyanogenmod 7 ? ?